This is a special listing for one custom hand painted pendant in memory of your pet. Your beloved cat, dog, or other pet big or small will be painted as a sweet little angel atop the clouds, complete with halo and wings. 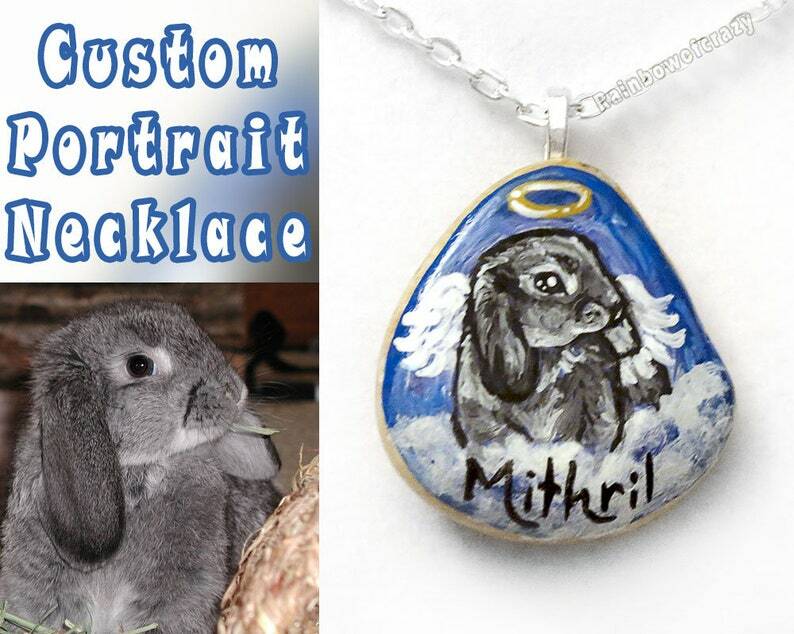 Hand painted on smooth, natural beach stone, this cute necklace is a reminder of that special animal in your life and can also be in memory of that beloved pet that has crossed over the rainbow bridge. This piece has been carefully painted, leaving the back of the pendant bare in order to showcase the natural beach stone underneath. Images of the painted piece will be sent via conversations for approval before shipping. I use the smallest paintbrushes I can and each piece requires a lot of love and patience to create. I want you to 100% love your necklace and will do what I can to make it perfect for you; however if multiple rounds of changes are requested, an additional fee may be required. *** Please note shipping times. Custom work can take up to 1-2 weeks to produce. 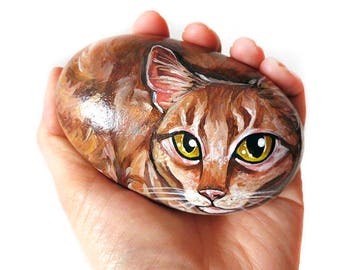 *** Pendants will have the shop name on the back - however, if you would prefer your beloved pet's name instead, please include a note with the order. I can't guarantee that I will be able to fit long names on the back so please note that short names or nicknames will fit best. Watermarks are not on the actual pendants. This pendant will be painted with acrylic paint on a smooth beach stone. The pendant will be sealed several times for protection and a nice shine. Each piece of beach stone varies in size (from 3/4" to 1 1/2" in length and width), shape, colour and texture, making each and every pendant one of a kind. If you are looking for a specific looking piece in terms of sizing, please message me before purchasing this listing and I can use the perfect piece for you. As a pendant, it hangs from a large rectangular silver plated bail that will fit most any necklace. 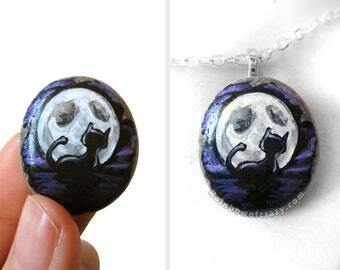 The pendant also comes with either a chain, or an organza ribbon cord necklace. The chain comes in a variety of lengths (16-26 inches) and opens with a lobster clasp. I've found that the clasp can also fit the actual chain loops; so the chain can be worn shorter. If you would like a length that's not listed, please make sure to leave a note with the order. // If you would prefer, also available is a black organza ribbon cord necklace that can be seen in the last photo. It also opens with a lobster clasp and the adjustable length can be worn anywhere from 17-19 inches. Please select your preferences when placing an order. Though moisture resistant and made with great care to last, this piece may not be completely waterproof. I would not recommend wearing this pendant in the shower or pool. Please use caution when wearing around sharp objects as to not scratch the artwork. Words cannot describe how beautifully my puppy was captured and painted. My family was super emotional over the commemoration. She is a PLEASURE to work with and am looking forward to my next piece. Packaging was just beautiful as well. DON'T LOOK ANY FURTHER; SHE'S THE BEST!!!! Thank you. Thank you.